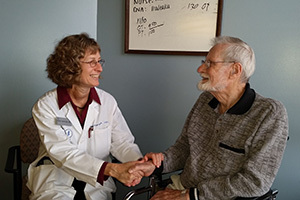 UW Department of Family Medicine and Community Health (DFMCH) Associate Professor and Geriatric Services Director Irene Hamrick, MD, believes that every clinician, regardless of specialty, should have the essential skills needed to care for geriatric patients. That’s why three and a half years ago, she established a teaching nursing home: a two- to six-week educational rotation that blends didactics with hands-on practice in the clinic, hospital, nursing home and community settings. To date, nearly 60 UW family medicine residents, internal medicine residents, geriatric fellows, and MD and physician assistant students have completed the rotation—and are entering practice or residency better equipped to meet the medical needs of an aging population. The teaching nursing home is based at Capitol Lakes, a continuing care retirement community in downtown Madison. Learners provide direct patient care there during rounds held three times each week. They, along with Capitol Lakes residents, also attend one of Dr. Hamrick’s 30-plus lectures on dementia, hearing loss, nutrition or other topics relevant to the geriatric population. (Many of her lectures are available online at the DFMCH’s YouTube channel or the SMPH’s video library). In addition, educational experiences take place at Capitol Lakes’ pharmacy, physical and occupational therapy facilities and nutrition clinics; at UW Health memory, sleep, swallow and falls clinics; at University Hospital’s Acute Care for Elders (ACE) service; and at senior centers, adult day care centers or other community organizations. Since April 2015, the rotation has been mandatory for family medicine and internal medicine residents and geriatric fellows. In July 2017, it will also be mandatory for MD program students. The rotation raises learners’ awareness of medical issues unique to the geriatric population—knowledge they may not otherwise have. For example, Dr. Hamrick, who is fellowship trained in geriatrics, teaches that dehydration is a very common cause of mental status changes in older people, and that because of their increased risk for hypoglycemia, older diabetic patients are better off with higher hemoglobin A1C levels than their younger counterparts. She also teaches learners how to write hospital discharge summaries for nursing home patients, and what services the nursing home can provide, which can help reduce unnecessary readmissions. Finally, she stresses the importance of connecting with local senior agencies, so that when learners get into practice, they will able to refer patients and families to appropriate community resources. Dr. Hamrick emphasized that geriatric care skills are needed in all specialties. “If a learner goes into radiology, pathology, gastroenterology or cardiology, they will need knowledge about aging changes and geriatric syndromes,” she noted. Feedback from those who have completed the rotation is very positive. Dr. Hamrick consistently receives high learner evaluations, and in 2015, the DFMCH’s Madison residents awarded her with the William Scheibel, MD, and the Baldwin Lloyd, MD, Clinical Teacher Award.